Torque is used for creating Tension. Mass will not change anywhere on the earth, even under zero gravity conditions, while weight is the amount caused by an acceleration that is felt by the body on which the acceleration is acting. In a no gravity zone there is no feeling of weight. The gravity acceleration is different depending on your lattitude location on the earth. The weight of an object depends on its mass and strength of the gravitational pull. Because torque is a product of length and force. The units used to describe torque reference both a force and a length. There are three common torque units: SI (International Standard) based on Newton meters, Metric based on kilogram force centimeters, and American/ English based on inch pounds. Why Do We Tighten Bolts and Screws? The fixing force is referred to as axial tension or tightening force and the objective of screw tightening is to apply an appropriate amount of axial tension. 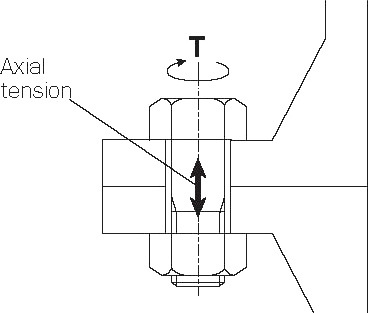 Although axial tension is really what needs to be controlled and measured, it is very difficult to do so, therefore torque is used as a substitute characteristic for administering and controlling tightening operations.